Hello friends, today i am writing an article for you which, will save you 71% charge on receiving international Payments. We as bloggers have clients from all over the world and they pay us through online payment services like Payoneer and PayPal or through wire transfer. But the problem is the extra charges you have to pay for every transaction done by you and the time delay for successful transactions. After reading this article, you will save more on receiving payments from your international clients. No need to pay charges when you receive money and get it transferred directly to your local bank. So this review will help mainly Online freelancers and SMEs. So guys, read, think and select the most suitable way of receiving money in your account and save more of your International/global/foreign payment. It is an online platform which allows you to send or receive international money quickly, simply and at reduced cost. Payoneer was founded in 2005 and headquartered in New York City. Payoneer is a registered Member Service Provider (MSP) of MasterCard worldwide. Payoneer have about 3 million users in 200+ countries & provides transactions in more than 150 currencies. I recommend Payoneer as the best service provider for receiving money globally for both SMEs and Freelancers and i will give you proper researched data to prove my recommendation. 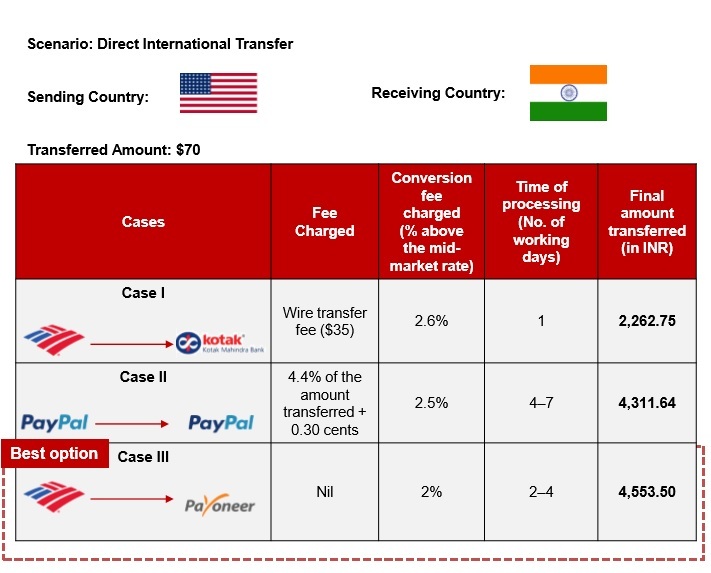 A recent research done by Let’s Talk Payments (LTP), an international FinTech content & research firm, came up with some shocking results after comparing the differing methods & costs of transferring B2B payments from the US to India. This study reveals that the Payoneer offers the lowest payment fees, reducing costs by up to 71%. You can download and read the whole research and analysis in this white paper. Global Money Transfer is now very easy. You just have to sign up for a money transfer service provider to start getting online payments. 1. Sign up to Payoneer. 2. Send your account details to your clients to receive money. 3. Wait and receive your payments directly to your local bank account. This service allows you to accept payments from your clients living in 200+ countries having 150+ currencies to your bank account in INR. As a freelancer, you may be working as an affiliate for many top brands and they will pay you money through wire transfer or through money transfer service providers. At Payoneer, you can accept payments from almost all top brands including Amazon.com, Fiverr, Taboola etc. How to Get Paid from Companies of all sizes? follow some steps written below. 1. While selecting a payment method, choose Payoneer as your preferred payment method on the company's platform. 2. Receive funds on time to your Payoneer account from N number of companies. 3. Get Fund transferred to your local bank account at very low cost. Apart from these two major services, Payoneer is also giving Below two services. 2. Payoneer App to stay up to date with your account information. To compare prices between PayPal and Payoneer i am using data from the white paper (link given above). Lets, assume that we are receiving money in our Indian Bank Account v.i.a direct international transfer ( example: your client is paying you $70). If you receive money from PayPal, you have to pay 4.4% + 0.30 cents as processing fee, which is Nil in case of Payoneer. 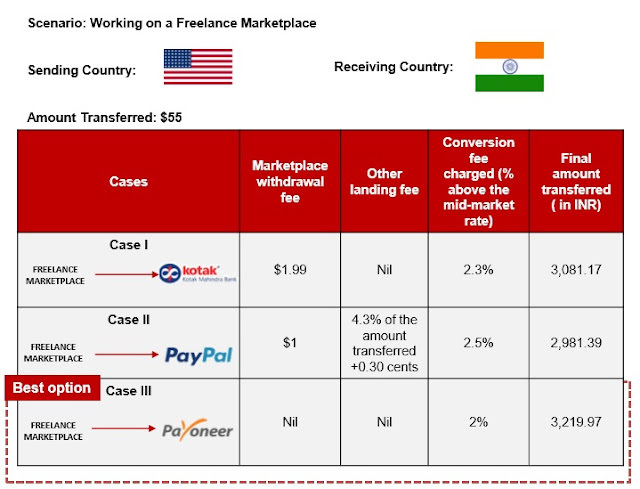 After that, when you transfer funds to your bank account you have to pay 2.5% as Conversion fee while in case of Payoneer, you have to pay only 2% conversion charges which is lowest possible Conversion fee in this market. So, the best option is Payoneer as you will get more money in your bank account and it will take only 50% time as compared to PayPal. Suppose you are working as a freelancer, and you are getting your payment from your Company. Here, you have to pay a flat 1$ as withdrawal fee and 4.3% + 0.30 cents other charges. While in case of Payoneer, Again, both types of fees are Nil, so you will save more if you are a customer of Payoneer. Again for currency conversion charges you will save 0.5% if you transfer payment from your Payoneer account. So, in terms of saving money as a Freelancer, you should sign up for Payoneer today. 1. Payoneer can help you reduce the cost of receiving international payments by 71%. 2. Indian customers get paid straight into their bank account, in INR. 3. Payment receiving Fee is Nill for receiving Payments on your Payoneer Account. 4. Payoneer is 200% faster in Transferring funds. 5. 200+ Countries, 150+ Currencies, and 24*7 Customer support. The above 5 points and the research done by Let’s Talk Payments (LTP), clearly proved that Payoneer is best for sending and receiving money globally. It can reduce cost of receiving payments up to 71% and transfer time of money in your bank account up to 50%. You can watch the Customer's Success Story below. Thank you for such an amazing guide.